When I first started thinking about what to make out of canning jar lids (for the canning jar lid craft challenge), one of the first things that popped into my mind was an owl. I knew I wanted to use the lids as owl eyes, but I had no clue what else to do for this craft. So, I started out by making the owl’s eyes and then kept building on them until I came up with this owl wreath. The first thing you need to do it paint the canning jar lids and the wood heart. It may take two or more thin coats of paint to get good coverage. This is especially true if there is writing or a design on the canning jar lid. Let the glue dry between coats so you don’t get bubbling, and also make sure it dries well before you move onto the next step. Using craft glue, a hot glue gun, or a combination of both, glue the two canning jar lids onto the bumps on the heart so it looks like two eyes and a beak. I like using both hot glue and craft glue together on projects. The craft glue will usually give you a stronger bond once it dries, and the hot glue dries so fast it will hold all of the pieces together while the craft glue dries. Finish the details of the owls face using two large buttons and a chenille stem. If you prefer, you can simply use paint to finish the eyes. The eyebrow is made by folding a chenille stem in half and using a hot glue gun to stick it around the outer edge of the canning jar lid. This is as far as I had gotten on my owl craft in my head so it sat on my craft table for a few days while I circled it and contemplated what to do with it. At first I thought maybe a magnet, but I knew it would be pretty big and heavy for that. The general idea for this wreath came to me in the middle of the night and then the owl wreath came together as I experimented in my craft room the following morning. The first thing I did was glue the eyes to the top of the wreath. To decorate the wreath, I first grabbed Ribbon and didn’t like that look at all. I then tried some jute twine and it still wasn’t quite right. I then pulled out my bin of feathers (yes, I do have a bin of feathers). I started randomly sticking them in here and there and loved the look. Just a little craft glue on the end of each feather held it in place. It still felt a little plain though. I pulled out the ribbon and jute twine again to experiment with bows to attach to the bottom of the wreath; again, it just didn’t look right to me. Looking at the wreath again, I thought perhaps the owl could use feet. First I grabbed a couple more wooden hearts but they just looked like hearts. I found the wooden sign in my box of wooden pieces and thought it would be perfect. I had to first cut it in half, I drew a line down the center and used a utility knife to make several slices through it until it cut all the ways through. I used sandpaper to smooth down the cut edge and also to round the corners just a little bit. If you don’t want to hassle with cutting the wood and sanding it down, you could always use craft foam. Finally, I painted the wooden feet orange. Once that dried, I use black paint to write “Who’s There?” on the feet. What do you think of it? Such a cute and creative wreath! I like the feathers and the owl face! I’m pinning this! Thanks so much Katie and I will check out your link party. Thanks Becca, I will check out your Friday Five Features! I collect owls and will do this for indoor owl. Also mu.main crsft is making cards so will adapt to card. So cute. Thanks Nicky, I will check it out! This is rich!!! How clever, and oh so perfect for the upcoming season!! And I’m a birder at heart, so this owl made it even more sweet. Such an adorable and easily made wreath. Think I have all the supplies handy to make it. Will wait til time to hang it up for the season. Love it, so cute and different. Happy weekend. I am obsessed with this project! So cute and clever!!! The pipe cleaner above the eyes really makes it look great! Stopping by from Hoyby Crafts. Follower! I have an aunt who collects owls, she would love this. I might have to make one for her. Thank you for sharing your owl wreath at Fluster’s Creative Muster. Now that you found our party I hope you will continue to join us every Tuesday evening. Super super cute!! 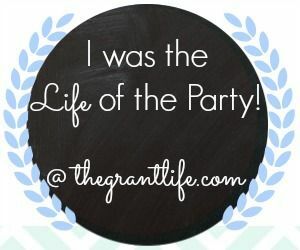 Thanks so much for linking up to the Life of the Party! Just a quick note to say Im going to feature this tomorrow in a fall inspired roundup! So cute Sherri. I think that kids would especially love it! Thanks for sharing with SYC. What an adorable idea! I love how easy it would be to put together. Stopping by from weekend-wonders. Thanks for the pin Jessica! Adorable! 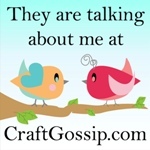 I found you on Fluster Buster…love your owl wreath – the feathers were a stroke of genius! What a cute wreath!! This is so original, I love it! What kind of wreath did you start with and where did you get it? Kind of looks like a twig wreath. Hi Donna, I used a grapevine wreath, which is made from twigs! It was approximately 12″ across. Sorry for the confusion! This wreath is absolutely so adorable–I have to make this for my family–they are going to flip when they see this. I’m going to keep it a surprise and just show up and watch their smiles when they see this cutie! Thanks so much for sharing your ideas. I love this! I duplicated it in crochet! I love this project. My boss loves owls, so i’m going to make this for Christmas and give it to her. Thank you for this craft!